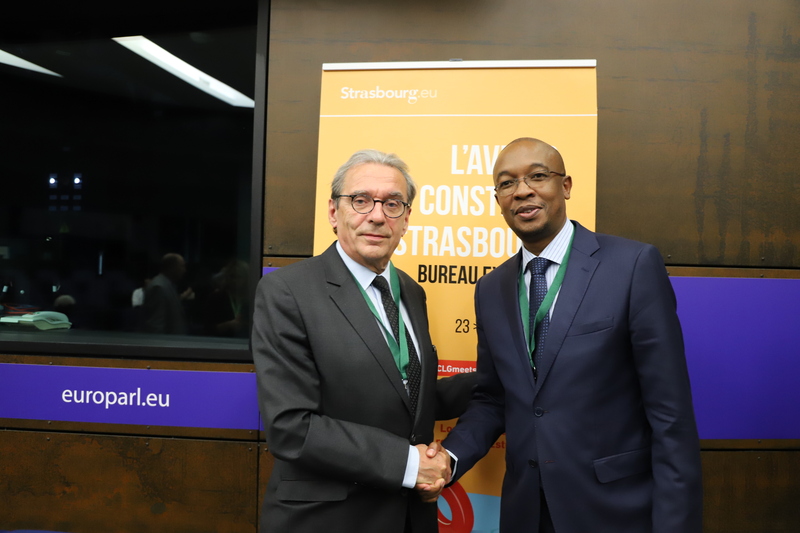 The 2018 UCLG Executive Bureau gathered over 300 local officials and practitioners, as well as more than 50 national government officials from more than 25 different countries in Strasbourg, France, in the European Parliament, at the invitation of Mayor Roland Ries, Co-President of UCLG. 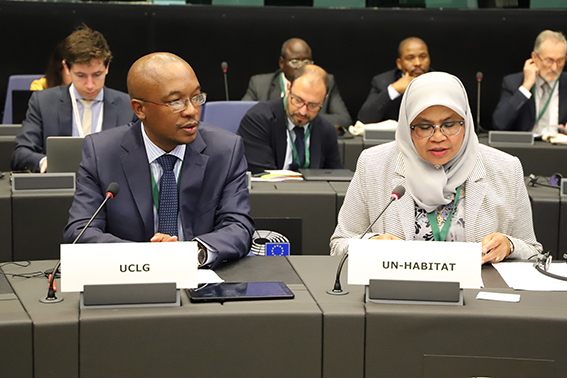 For the first time that the meetings of the governing bodies of UCLG include a dialogue between National and Local Governments, set up in collaboration with UN-Habitat within the framework of the United Nations Advisory Committee of Local Authorities (UNACLA) and the Global Taskforce. The sessions aimed at paving the way towards the High Level Political Forum which will take place in July and will have Goal 11 on Sustainable Cities under review. The spaces for debate hosted by the UCLG Policy Councils created a safe environment for exchange where both national and local and regional governments representatives identified priorities to be tackled in order to achieve the universal goals underpinning the 2030 Agenda. The two day discussions underlined the need to ensure political will from national governments to increase capacities at local level. It further called for local and regional governments to embrace the global agenda as their own and enrich its implementation with local experiences and vision. The Executive Bureau was introduced by a High Level Session featuring UCLG Co-President Ries, the UN Assistant Secretary General and Executive Director of UN Habitat Maimounah Sharif and representatives of national and local governments as well as the European Parliament and the Ministry of Foreign Affairs of France. “If we want to have a chance of achieving the Sustainable Development Goals, we need to get our cities right. If we want to get our cities right, they need the necessary enabling environment. We need to recognize governance as one of the drivers of sustainable urban development. When it comes to concrete reforms and transformative action to improve the lives of citizens in small and intermediate towns, territories and metropolitan areas, it is essential to find new ways of governance that allow urban diversity to become an advantage. The co-creation of solutions is the only way if we are to succeed with this vital plan for humanity and planet”, Maimounah Sharif, Executive Director of UN Habitat. 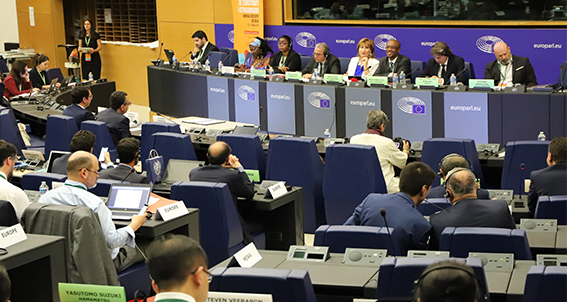 The business session of the Executive Bureau, chaired by President of UCLG Mpho Parks Tau and UCLG Co-President Roland Ries, acknowledged the changes that UCLG is undergoing to meet the demands of a changing world. He highlighted the work which is being done in order to further cement the perspectives of local and regional governments in the implementation of the global development agendas by continuing the quest to enhance our spaces at the global tables and expanding partnerships with all types of stakeholders. “We need to set an example. We need to start discussing models and questioning how we have done things until now and how to act moving forward. Our members need to be able to count on us to bring their ideas to the communities of practice and offer safe spaces for exchange and learning but also for advocating visions and ideas.” Parks Tau, President of UCLG. In view of the increasing situations in which the integrity of local government and its representatives are undermined around the world, the Executive Bureau has commended the initiative by the city of Paris on behalf of the UCLG Presidency to deepen partnerships that will allow the organization to enhance its understanding and mapping of the state of local governance situations across the world. Vice Mayor of Paris, Patrick Klugman, presented the work to be developed in three pillars: working with international organisations that are monitoring democracy globally (such as International IDEA) with a local component building on our GOLD report, expanding our own Observatories on Participatory Democracy that is exploring the future of democracy and a third pillar on the protection of local elected officials and the development of a specific status preserving their institutional role in partnership with the International Federation of Human Rights. The Presidency recalled that the new dynamics of our world (insecurity, intensification of conflicts throughout the world, displacement, …) underscore the importance of counting with enhanced advice and visions, to allow our organization to be fit for purpose in supporting members in how to address the urban challenges, but also in anticipating new scenarios. An interdisciplinary advisory system will be put in place reflecting the diversity of our membership and its priorities. The Executive Bureau agreed that it would have been impossible to achieve some of our success at the negotiations of the global agendas without the support and commitment of like-minded stakeholders. It also agreed that it was time now to deepen the partnerships, going from exchange to collaboration and concrete joint action, in order to better support local and regional governments. In the framework of the Executive Bureau, a session was held on Territorial Prevention and Management of Crisis, in common with the Global Alliance of Urban Crisis, which tackled how to enhance the synergies and partnership between both organizations and their members, as well as the visible progress which had been made since the partnership started on issues such as localization and the nexus. The Business Session of the Executive Bureau also addressed the issue of youth, Mayor of Kareesi Yücel Yilmaz proposed a partnership with UN Habitat Youth to empower young people, with the aim to strengthen representation of the youth and involving them in the decision making processes. Benali Nidal, president of the Young Urban World Council, welcomed the idea and proposed a strong network of youth councils, paired with a catalogue of best practices to aid mayors in delivering their messages. The Executive Bureau welcomed the concrete commitments jointly undertaken with sister organizations within the framework of the Global Taskforce and beyond. It applauded the Presence of the Chairman and Secretary General of the Commonwealth Local Government Forum (CLGF), Greg Munro in the meetings and the work announced on the localization of the Sustainable Development Goals as well as in bridging inequalities, in particular through the promotion of the participation of women in politics. The Bureau further welcomed the initiatives to introduce the urban perspective in the agenda of both the G7 and G20. It expressed full support to the U20 initiative convened by C40 in collaboration with UCLG, it took note of the Joint Statement being developed and expressed its support as World Organization to the initiative lead by Co-President Anne Hidalgo, Mayor of Paris and Mayor Horacio Rodríguez Larreta of Buenos Aires. A new era of UCLG-ICLEI relations was announced, which would culminate in the signature of an MoU and institutional presence in the ICLEI Congress in Montréal on 20-22 June. Sustainable mobility will be a high political priority as we work towards the 2019 World Congress in Durban. An MoU was signed with the International Association of Public Transport (UITP) which brings together all public transport stakeholders from 96 countries throughout the world. Sustainable mobility goes beyond transport system: it needs to guarantee environment friendly policies, social inclusion, underpin public space policies and support resilience plans. This stronger partnership will build on the experiences of a Community of Champion Cities and will contribute to delivering on SDGs 9 and 11. 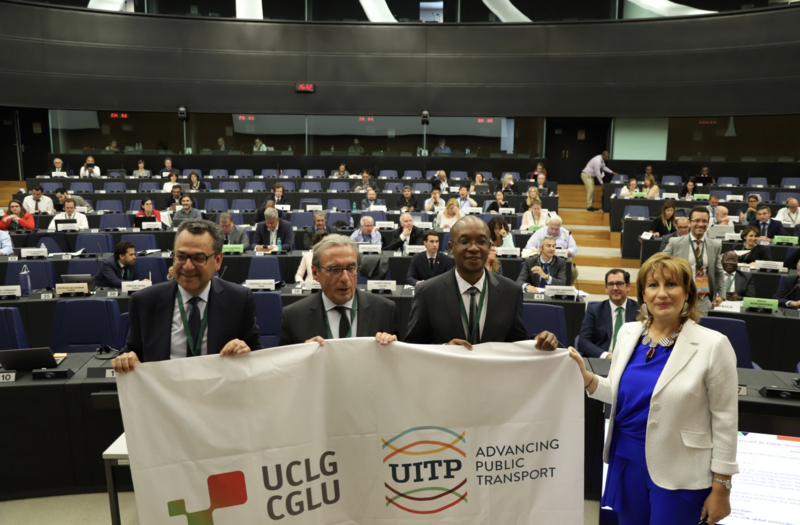 The Secretary General of UITP Mohamed Mezghani recalled the strong synergies between the expertise of its organization and the local decision makers gathered in UCLG. Few things will define our capacity to deliver as much as a renewing the municipal finance systems both nationally and internationally. 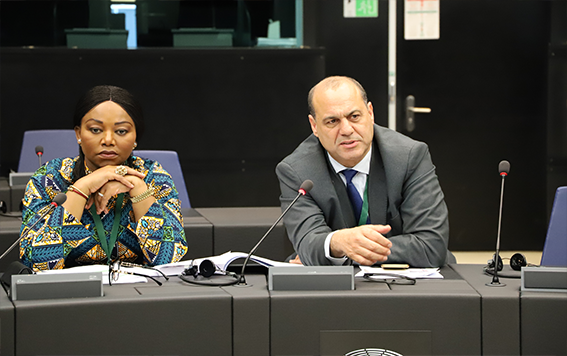 In Strasbourg, UCLG has adopted the outline of a Strategy that will seize the opportunity to build and enforce a compelling narrative on Local Finance with the aim of strengthening our voice internationally as primary stakeholders of the global agendas. This work will build on the experience of the World Fund for City Development (FMDV) which will be naturally reintegrated in into the UCLG organization and will further count with the support of the United Nations Development Capital Fund (UNCDF), which will launch a Local Fund with UCLG and will co-lead a Global Coalition of local governments and financial institutions campaigning for new financial instruments. Intermediary cities contribute to the territorial cohesion and integration of their regions and countries, and can play a critical role in sustainable national urban policies aiming at addressing the challenges of rapid urbanization, and of large metropolis that are unable to provide for the needs of all. The Forum on Intermediary Cities, will hold its first world gathering in Chefchaouen from 5-7 of July at the invitation of Mayor Sefiani. It aims at bridging the knowledge gap on the understanding of the full potential and importance that these cities can play in global development. It bring together different stakeholders that will together develop a Charter Agenda that will lead the way for Intermediary Cities towards 2030. UCLG’s strategic priorities are conceived around the notion that local and regional leaders need sound evidence, as well as timely advice, in order to develop the actions towards localizing the SDGs. The Local4Action Hub, an initiative co-developed with the Swedish International Development Agency (SIDA) aims to further consolidate UCLG’s capacity to deliver on the 2030 Agenda and to support its members in innovation, learning and visibility of local action. The Local4Action hub should enhance the potential to deliver on the core objectives of the Strategic Partnership with the European Union aiming at promoting good local governance, capacity building and protection of human rights as well as bridging inequalities. It should further enhance the networks’ capacity to promote municipal international cooperation at the country level and the contributions to the UN lead platform, the Local2030Hub. The winners of the UCLG-Mexico City Culture 21 Award 3rd Edition were announced by Eduardo Vazquez, the Culture Secretary of Mexico City. Lyon, in France, and Seongbuk in the Republic of Korea were the winners of this edition that counted with over 90 candidatures from all over the World. The Charter of Cultural Cooperation in Lyon in has been implemented for over 15 years in Lyon, involving 27 municipal services, cultural projects and events, including those that receive the most funding from the city, which altogether carry out over 300 projects, actions and services adapted to the challenges of policies that connect culture and sustainable development across the city. The programme “Common Seongbuk Artist Roundtable: Local Culture Governance” began in 2014 in Seongbuk, a district of Seoul, and has become the most important community initiative in this area, involving over 300 people working together on the basis of cultural governance. The Artist Roundtable defines itself as a network that works together for the coexistence and cooperation of the local culture. The two awardees of the 2018 edition, in the “Individual” category, who recognises internationally-renowned people who make a fundamental contribution to the relationship between culture and sustainable development, were ex-aequo, civil society activist Basma ElHusseiny, leader of the Action for Hope organization, and philosopher Patrice Meyer-Bisch, who is renowned for his work in the field of cultural rights and currently chairs the Observatory on Diversity and Cultural Rights. The Jury also decided to make special mention of the following six projects (in alphabetical order): : Dublin, Hamilton, Montevideo, Nablus, Novosibirsk, Saha-Gu, Nablus. These six projects are excellent examples of local implementation of Agenda 21 for culture. After the escalation of the conflict which took place during May 2018 in Gaza where over 60 Palestinians lost their lives, the UCLG Executive Bureau adopted a motion condemning the deaths of civilians and calling its members in Israel and Palestine to renew dialogue. The motion also calls members from around the world to support peace and solidarity initiatives.